The Hopeful Mindset delineates the highly influential differences between the beliefs that arise out of seeing ourselves as independent selves and seeing ourselves as interdependent selves. In this context the word “independent” refers to an individual who believes he or she is free from outside forces dictating his or her choices. In this sense, an independent person is separate from others and the environment in which they exist. They do not depend on others or the world for their existence. They see extreme self-sufficiency as a virtue. Certainly a degree of self-sufficiency is a good thing and high dependence on others should be restricted to the very young children and the mentally and physically handicapped. On the other hand, when we view ourselves as existing interdependently with others and with our environment it becomes evident that a considerable degree of dependence on others and the systems that sustain us is not a sign of weakness but wisdom itself. No living thing exists separately from other living things and its environment. Life is an interdependent phenomenon. Even the simplest of life forms depend on environmental conditions to survive and procreate. I believe there exists in the minds of many a misconception about what it means to be an independent individual. This misconception springs from the various definitions of the word. 1 free from outside control; not subject to another’s authority: an independent nuclear deterrent | the study is totally independent of central government. • (of a country) self-governing: India became independent in 1947. • not belonging to or supported by a political party: the independent candidate. • (of broadcasting, a school, etc.) not supported by public funds: an independent girls’ school | independent television. 2 not depending on another for livelihood or subsistence: I wanted to remain independent in old age. • (of income or resources) making it unnecessary to earn one’s living: a woman of independent means. 3 capable of thinking or acting for oneself: advice for independent travellers. • not influenced by others; impartial: a thorough and independent investigation of the case. 4 not connected with another or with each other; separate: treating each factory as an independent unit of production | the legislature and the judicature are independent of one another. • not depending on something else for strength or effectiveness; free-standing: an independent electric shower. • Mathematics (of one of a set of axioms, equations, or quantities) incapable of being expressed in terms of, or derived or deduced from, the others. From this quotation alone, it seems to me obvious that Thomas Jefferson and the others that worked on the Declaration supported equal rights for all people, not just those of a particular nation, religion, or race. These rights are inclusive, not exclusive. They are the inalienable rights of all people everywhere. 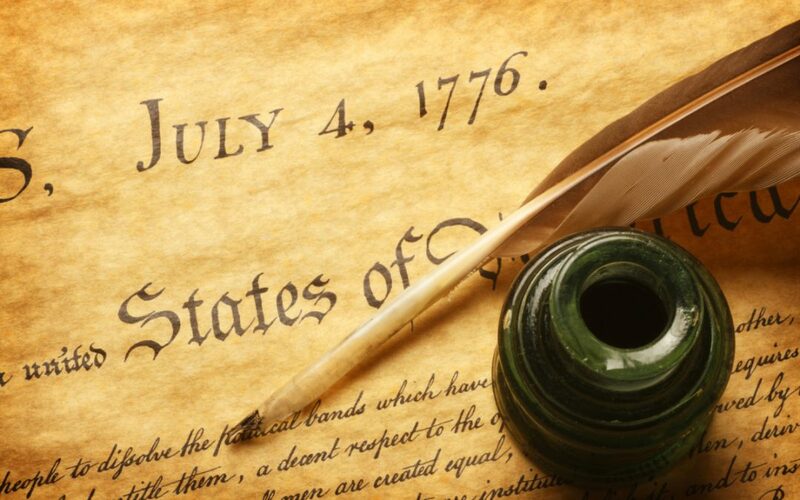 The problem I have been referring to occurs when the kind of freedom from tyranny that the Declaration proposes is assumed to include or be synonymous with an idealized independence from institutions, other people, and natural systems. Much harm has been done in the pursuit of this kind of independence. We have damaged our planet. We have waged horrific wars. We have marginalized large portions of the world’s population. And yet today many still pursue this harmful vision of independence. I believe that the desire for this kind of independence stems from the mistaken assumption underlying our default Cynical Mindset. As discussed in The Hopeful Mindset, the Cynical Mindset arises naturally when we believe ourselves to be separately existing beings. As independent individuals we recognize our vulnerability to mistreatment from others and the dangers presented by the unpredictability of nature. Out of fear we seek to establish impenetrable defences against “the slings and arrows of outrageous fortune”, never realizing that we are walling ourselves off from the world at the same time. Those seeing themselves as interdependent individuals do not deny our essential vulnerability but see hope in a different response to it. The values of The Hopeful Mindset are based on the interdependent view of reality supported by modern science where no thing has independent, separate existence. Interdependence based values include vitality, resiliency, sustainability, inclusive connections, personal responsibility, humility, and contribution. Surely, it is individuals acting on these values, as opposed to those of the Cynical Mindset, who will work to insure our shared and inalienable rights to equality, freedom from tyranny, to life, and to the pursuit of happiness.